For dramatic wide angle shots coupled with superior portability, the 12-24mm wide angle zoom lens helps you take professional quality pictures wherever you travel. Adding to the convenience is the I-Function feature, which gives you one-touch access to your camera's manual settings. Adjust the aperture, shutter speed and more with just a twist of the lens while previewing the image in real-time. 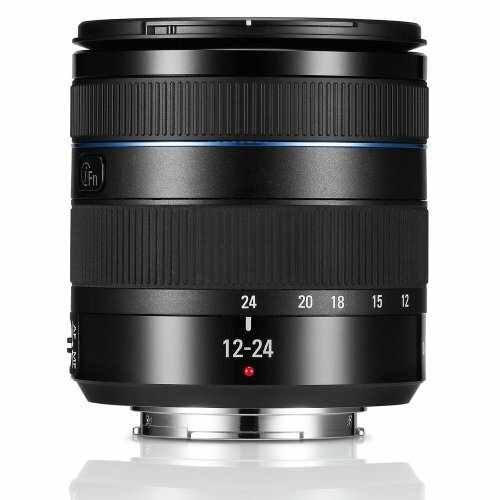 This 12-24mm compact wide angle zoom lens is compatible with all Samsung NX Compact System Cameras. Ultra compact wide angel zoom lens that gives you maximum control over your perspective making landscapes, interiors and even portraits more dramatic and expressive. Features Extra-Low Dispersion (ED) glass which ensures clearer and sharper, high-resolution images and reduces chromatic aberration.